Mido has released another design in its Multifort collection. The watch this time around is quite clean looking and it is a Limited Edition. The quantity available is going to be just 999 pieces. This release comes in conjunction with the Multifort’s 80th anniversary. This makes the series the longest running collection in horology. Many aspects of the Multifort range are reminiscent of the Sydney Harbor Bridge, which was opened only two years before the release of the first Multifort watches. 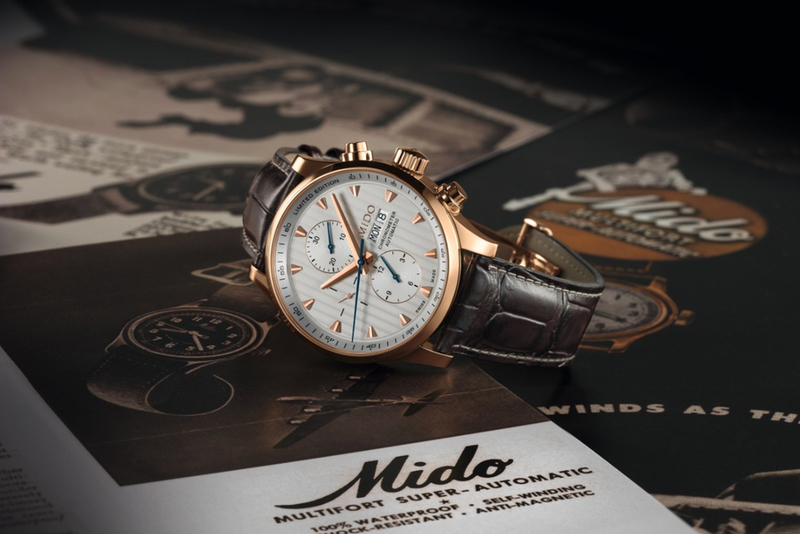 The Mido Multifort Limited Edition Heritage is crafted in 316L stainless steel and coated with rose gold PVD. Case dimensions are 44mm for the diameter. The tripartite case is brushed and polished in all of the right places for a gorgeous finish. Both the case back and the crown are screw locked, which helps to maintain the water resistance at 100 meters or 10 ATM. The case back also features a sapphire crystal, which allows the wearer to see the movement. Adorning this watch is a brown calf skin leather strap with a crocodile look, which is fastened with a folding clasp also made from rose gold PVD stainless steel. The dial is silver but upon closer inspection there are vertical Geneva waves that give this piece a sophisticated aesthetic. The chronograph subdials are located at the 12 and 6 positions, while the small seconds counter resides at the 9 position. This watch is also equipped with day and date apertures at 3 o’clock. The hands and indexes are all rose gold toned, which contrast wonderfully against the dial. The hands for the chronograph counters are in blued steel, which differentiates it from the other functions for easy readability. The movement is the self-winding mechanical Valjoux 7750, which has been modified and certified a chronometer by the COSC. COSC chronometers are among the most sought after movements in the industry due to their enhanced accuracy. The autonomy stands at 48 hours, and the Glucydur balance wheel alternates 28,800 times every hour. The movement also features an Incabloc, and a Nivacourbe shock absorbing system, a Nivaflex mainspring, and an Anachron balance spring. In total, this timepiece from Mido is pretty spectacular using many cutting edge technologies, which make this one very accurate watch.